Here is some info on the various helmet campaign materials you can order from the Phoenix Children's Hospital/Maricopa County Safe Kids campaign. Some of their materials, and their stickers, are available in Spanish. 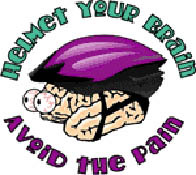 The Helmet Your Brain - Avoid the Pain© program is an educational "train the trainer" curriculum that encourages bicycle helmet use with easy to follow content and interactive teaching materials. It includes the concept of peer to peer small group activities that work to change behavior. The Helmet Your Brain - Avoid the Pain© program supports the research done for 4 years at Phoenix Children's Hospital and other research available on helmet use. The Helmet Your Brain - Avoid the Pain© Elementary Program is contained in a box and consists of the curriculum and work sheets, a brain gelatin mold, a model of a skull, two safety videos, a bike helmet, program stickers and a "brain book" reference guide. A special Helmet Your Brain - Avoid the Pain© adult helmet safety presentation, a primary curriculum, an abridged curriculum and a Spanish curriculum are also available. In May 2008 Susan Bookspan said they would soon have available a new interactive DVD on bicycle safety. Please contact Phoenix for pricing and ordering info. Program summary: Based on research conducted by Phoenix Children's Hospital, only 21 to 22 percent of the children in Phoenix wore helmets while biking, inline skating, or riding scooters. Also, surveys showed that children were more likely to wear helmets if their friends did. Group dynamics and social pressures are important factors for consistent helmet use among children. The goal of Helmet Your Brain - Avoid the Pain© program is to encourage the use of helmets by children biking, inline skating, or riding scooters. The program offers the student information about the brain and what can occur if the brain is injured. It also provides information about how the brain can be protected by the use of a helmet. Most importantly, the program offers the student an opportunity to discuss and role-play various ways to encourage helmet use among peers. This train-the-trainer program is taught by teachers, youth organization leaders, health professionals, and parents. The inter-active Helmet Your Brain - Avoid the Pain© program materials are contained in a box and include everything a presenter needs to prepare for and conduct a class. The program consists of the curriculum and work sheets, a brain gelatin mold, a model of a skull, two safety videos, a bicycle helmet, program stickers, Phoenix Children's Hospital Bike Safety brochures, and a brain book reference guide. There is also a Spanish language version and an abridged version.Currently, the program is distributed through a lending program to schools and organizations in Maricopa County, Arizona (Phoenix metro-area). It is also can be purchased by interested educators (contact Susan Bookspan for more information). All funds are used to add materials to the program. Evaluation: The Injury Prevention Center at Phoenix Children's Hospital began a bicycle helmet use observational study in January of 1998 and has conducted it annually since then. During the Fall of 2001, schools that conduct the Helmet Your Brain© program will also answer pre- and post-class surveys to measure the effectiveness of the program in changing the practice of helmet use. In past surveys conducted in the Phoenix area, helmet use by children has generally increased during the last four years: 1998 - 16 percent, 1999 - 14 percent, 2000 - 22 percent, and 2001 - 21 percent. It is believed that this increase is due primarily to an overall increase in awareness about the importance of helmets. Funding:The original funding was from the Safe Kids Coalition of Maricopa County, Arizona. This group hosts many activities that raise funds for various projects. The funding goes to the Bicycle Safety Partnership, which in turn created the Helmet Your Brain© program as one of its projects. The program now is primarily funded by proceeds from sales of the program materials. Other funding is from Phoenix Children's Hospital Injury Prevention Center, Phelps Dodge and Target Stores. Publicity:Program information is sent bi-annually to school principals, nurses, librarians and physical education teachers in Maricopa County, AZ. These postcards give a brief overview of the program and a number to call to reserve the program for free. Requests for the program filtered in slowly but ultimately the program became in high demand. The largest users are schools, fire departments and police departments and other Safe Kids Coalitions.A helmet design contest has also been an effective publicity method for the program and has also served to counter the idea among children that helmets are not "cool" among their peers. The contest is co-sponsored by the Arizona Diamondbacks world champion baseball team. Contest packets include information about the Helmet Your Brain -- Avoid the Pain© program and how to reserve it. Successes: The most important aspect of this program has become the fact that everyone involved is giving students the same consistent helmet message. It is an all-inclusive interactive format, which the teachers and other users found easy to use. The program creates "helmet experts" who spread the helmet safety message. In 2001, the program reached over 30,000 children and adults.To date, the program boxes are in constant use and the reputation of the program has continued to grow. Program requests come in from all over the country. The BSP sells the program boxes to users outside of Maricopa County, but continues to provide them free to any school or group within Maricopa County. All receipts are used to provide more program boxes. The Helmet Your Brain - Avoid the Pain© program is available in Spanish, as an abridged version, as a primary program and as an adult program. Challenges: One limitation of the program is not having enough "brain boxes" to go around. The current goal is to get enough funding to have a box in every school, library and parks and recreation department in Maricopa County. This evaluation was originally written by Doug Bell for NHTSA, and updated by Susan Bookspan in 2002.